Downey, CA—The Christmas and New Year’s holidays are ways to spend time with family and friends ringing in another year, but also a time when people can make poor choices that put themselves and others at risk on the road. 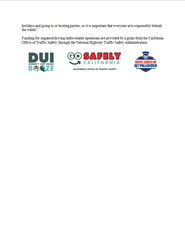 To help spread the message about the dangers of drunk and drugged driving, The Downey Police Department is partnering with the California Office of Traffic Safety (OTS) and National Highway Traffic Safety Administration (NHTSA) to get impaired drivers off roads. 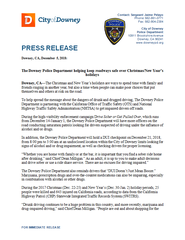 During the high-visibility enforcement campaign Drive Sober or Get Pulled Over, which runs from December 14-January 1, the Downey Police Department will have more officers on the road conducting saturation patrols looking for drivers suspected of driving under the influence of alcohol and/or drugs. In addition, the Downey Police Department will hold a DUI checkpoint on December 21, 2018, from 8:00 pm to 3:00 am at an undisclosed location within the City of Downey limits looking for signs of alcohol and/or drug impairment, as well as checking drivers for proper licensing. The Downey Police Department also reminds drivers that “DUI Doesn’t Just Mean Booze.” Marijuana, prescription drugs and over-the-counter medications can also be impairing, especially in combination with alcohol or other drugs.